Is stát é Carolina Thuaidh (North Carolina as Béarla) atá suite i ndeisceart S.A.M.. Úsáidtear an giorrúchán NC don phost. 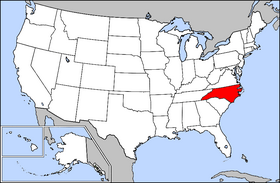 North Carolina.gov - Suíomh idirlín oifigiúil. Tugadh an leathanach seo cothrom le dáta an 30 Nollaig 2017 ag 07:06.